(CNN) — Ahead of a grand jury’s decision on whether to indict a police officer in the killing of Michael Brown, Missouri has both called in the National Guard and diminished the role of the Ferguson Police Department. Missouri Gov. Jay Nixon declared a state of emergency Monday as a precaution, he said, in the event of unrest or violence. It’s unknown when the grand jury will hand down a decision on whether to indict Ferguson Police Officer Darren Wilson for his fatal shooting of Brown, a teen. Prosecutors have suggested the grand jury would be done deliberating in mid- to late November. At the national level, the FBI last week issued a bulletin to law enforcement urging vigilance in the days before the Ferguson grand jury decision, according to a law enforcement official. The bulletin did not cite any specific intelligence to suggest there was any ongoing threat to officers. It was based on what had occurred during previous protests. 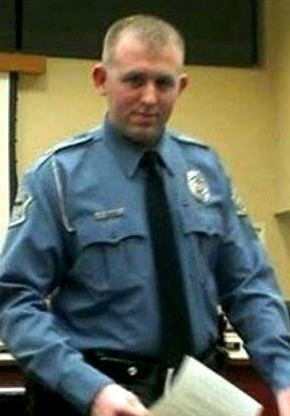 The bulletin expressed concern over possible violence relating to Ferguson protests and warning officers to be vigilant. In addition, it also mentioned that officers should take proper precautions and be vigilant over possible hacking of their personal information, the law enforcement official said. 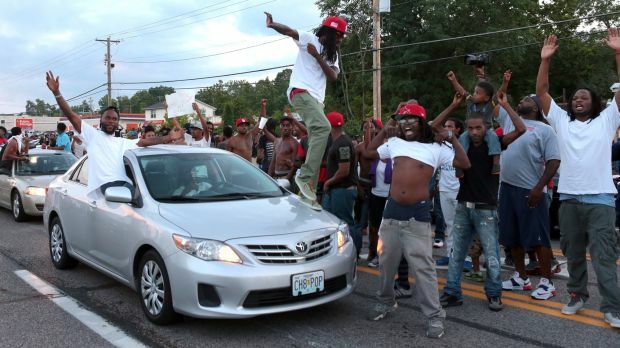 Protesters in Ferguson after Michael Brown’s murder by Darren Wilson. Nixon said people have the right to protest peacefully but that citizens and businesses must be protected from violence and damage. St. Louis Mayor Francis Slay said the governor’s plan will bring National Guard troops to St. Louis County, where Ferguson is located, but he said their role is designed to be secondary to local law enforcement. As Missouri prepared to deploy the troops — officials did not say how many — the role of the Ferguson Police Department in the case of unrest in that city will be reduced. In the event of unrest in Ferguson, that city’s police will not be at the forefront of a response, Nixon said in a teleconference with reporters. The St. Louis County Police Department will lead any response, and they will be the ones coordinating with the National Guard, if needed. The governor expects the role of Ferguson officers will be to handle routine calls not related to protests or unrest. Brown, a black teen, was fatally shot by Wilson, a white police officer, on August 9. The grand jury is weighing whether to indict Wilson. 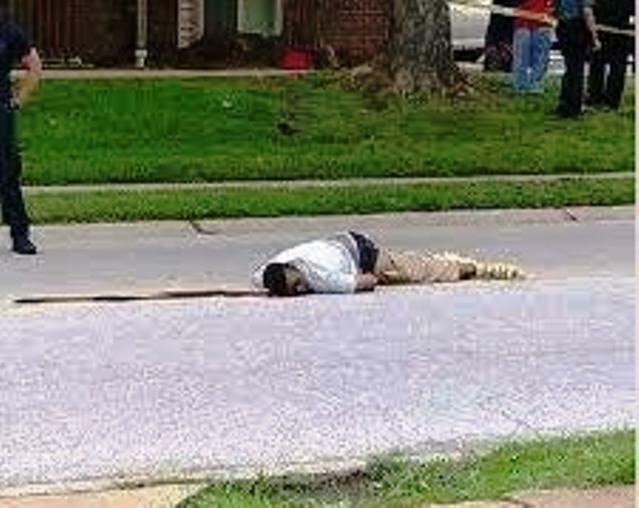 Senseless act of violence and destruction: Mike Brown’s body lies in street for four hours before being removed, as his family, friends and neighbors watched in horror. “In the days immediately following Michael Brown’s death, peaceful protests were marred by senseless acts of violence and destruction,” the governor said last week. “That ugliness was not representative of Missouri, and it cannot be repeated,” said Nixon. The state of emergency will expire in 30 days unless extended by another order. They will play a secondary role, he said, and will be partnered with local law enforcement anywhere they are posted. While Slay emphasized the back-up role of the National Guard, he said he agreed with the governor’s decision to declare a state of emergency. 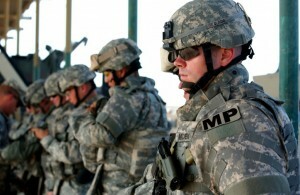 The troops are needed for visibility and deterrence, Slay said. There are too many unknowns about what the grand jury decision might be and how the public may react, he said. Slay said it makes sense to be prepared in case there is violence. The governor said the goal is to keep citizens safe while protecting people’s right to protest.